Anyone who climbs mountains regularly knows that the climber gets to plan, and to attempt, but the mountain has a say–if not a deciding voice–in whether or not you stand upon its peak. In some cases, that also goes for whether or not you even see the summit. 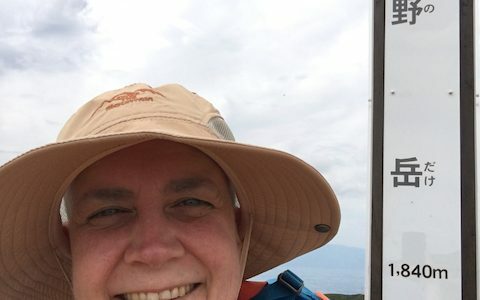 On July 19-20, 2018, I fulfilled a lifelong dream and stood atop the summit of Fujiyama, the highest mountain in Japan (3,776 meters). And this time, I did not climb alone. 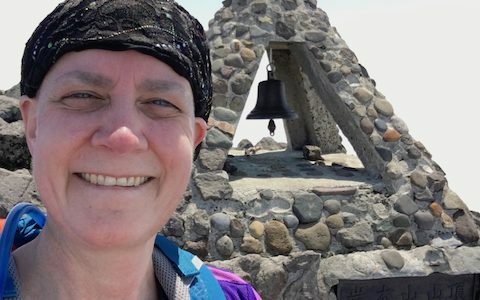 Yesterday (Saturday, June 30) I traveled from Tokyo to Mount Daisen – a distance of almost 750 km – to prepare for this morning’s climb of Mount Daisen. It rained all afternoon, but the weather forecast suggested a two-day clear weather window approaching, and I wanted to be in position when it arrived. I spent the night at a lovely, welcoming temple – Sanraku-so – which sits immediately adjacent to Daisen-ji, at the base of Mount Daisen. Although I fell asleep listening to the wind howl around the temple, I awoke to a spectacular sunrise/moonset that promised a beautiful climbing day. 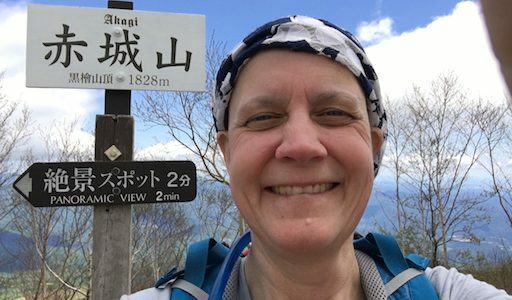 On Tuesday, I completed my sixth hyakumeizan – 1,841-meter Mt. Zaō in Yamagata Prefecture. As a complex volcano, Zaō-san has many peaks, the highest of which is actually Kumano-dake (hence the name on the summit sign in the photo). As the most active volcano in the Tohoku region of northern Honshu, Zao continually emits volcanic gases (and the summit smells of sulfur). Today, I climbed Mt. Iwaki in Aomori Prefecture – my first Tohoku hyakumeizan. Tohoku is the northernmost part of Japan’s largest island, Honshu – the same island where Tokyo and Kyoto are located, but many hours’ travel to the north, via shinkansen (bullet train). It took me almost 7 hours to travel from Tokyo to Hirosaki, the closest town to Mt. Iwaki – four hours on a high-speed shinkansen, and another 2:45 on a local train. These mountains are spread all across Japan, which means I get to travel the entire length of the country while I’m climbing. To the Summit of Mt. Akagi! Yesterday (May 20, 2018) I climbed my first hyakumeizan peak – Mt. Akagi, in Gunma Prefecture. While many of the details will have to wait for the book (100 SUMMITS is under contract with Prometheus Books, for release in 2020) I’ll be sharing photo essays about my climbs, and some fun details about the mountains, here on the blog in the months to come.